A long overdue vacation, an unfortunate accident, and a brain death. The story of a successful heart transplant must always begin with some bad news—someone has to die, for another one to live. 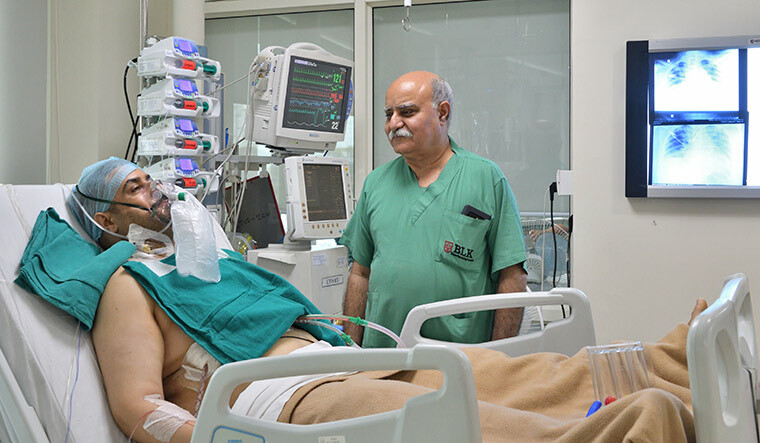 Dr Ajay Kaul, head of department of cardio-thoracic and vascular surgery at Delhi's BLK Super Speciality Hospital, recalls one such story—when the heart of an army man from Saharanpur was transplanted into a youth from Haryana. The army man had died in an accident and his family had donated his organs. Kaul had a perfect recipient for the heart—a 28-year-old youth from Haryana, who had been diagnosed with end-stage heart disease. “The young man had been having trouble with daily activities because of a severe left ventricular dysfunction. Both the valves in the heart were leaking [the valves were unable to stop the oxygenated blood from flowing back into the left ventricle instead of going forward to the rest of the body]. Even taking a bath was an effort for him. Such a condition is common among patients with this disease,” says Kaul. A heart transplant, says Kaul, is performed when all hope is lost. In cases where medication and treatment fail to work, death is imminent in the absence of a transplant. But, owing to a shortage of donors, the number of heart transplants remain largely constant around the world—only 4,500 heart transplants are being done every year. “Around 50 per cent of these are being done in the US. With the number of these surgeries remaining constant, few will survive the waiting period,” says Kaul. “In a transplant that we did recently, a man in his fifties had been waiting for more than a year. He had been in and out of the hospital, and few in his condition would have made it,” he recalls. Once information about the availability of the organ reaches the hospital, swift action is needed, says Kaul. A designated transplant coordinator receives this information from the National Organ and Tissue Transplant Organisation (NOTTO), and calls are made immediately to those on the waiting list, who can reach the hospital in a couple of hours. The heart, say doctors, will stay 'alive' for only up to four hours. The recipient is checked for his suitability for transplant; the blood group must match for the body to accept the new heart. “All patients are not suitable for transplant. They must not be older than 60, and their other organs must be in good condition,” he says. After the heads up for an available heart is received, surgeons from the transplant team are immediately dispatched for harvesting the organ. The transplant team of about 7-8 members has experts in harvesting and implanting, and support staff such as nurses. The heart—preserved in a solution—is transported back to the hospital via a green corridor. The recipient is given anaesthesia and prepared for the surgery. The surgeon will begin by cutting open the chest, slicing the breastbone into two, “like in any other heart surgery”. “We have now reached the damaged heart, which is beating and full of blood. But, the blood flow has to be stopped for us to proceed,” says Kaul. The heart is cut free from the vessels; the vessels are connected to a heart-lung machine, or a cardiopulmonary by-pass pump, to keep the patient alive through the process. “This machine can keep a patient alive for two-three hours. It basically does the work of the heart,” he adds. Meanwhile, the 'new' heart is trimmed and any extra muscle is cut off to fit the recipient. The 'trimmed' heart is then stitched back with the vessels, and this process will take about 55 minutes, says Kaul. The success rate of the transplant is 85 per cent—this percentage reflects those who will live for a year after transplant. About 72 per cent will live for five years and 20 per cent will live until 20 years. “For patients where there is no hope and no treatment, these success rates are fantastic,” says Kaul. In about 20 per cent of the cases, there maybe a rejection of the organ. In very few cases, where a heart transplant cannot be done because of the absence of a donor, a left ventricular assist device (LVAD) is used. “This is a bridge to transplant and is used in cases where the left side of the heart fails. In India, however, very few of these devices have been implanted,” says Kaul. The device is expensive, costing about Rs 90 lakh. In addition, the cost of the batteries could run into another couple of lakhs, every few months. After the LVAD is implanted, patients are advised some lifestyle modifications—for example, they are asked to avoid swimming. Failing heart ventricles can also be replaced with a total artificial heart (a mechanical pump that works to pump blood to the body), says Kaul. The technology is not available in India, and even abroad the results have not been good. Despite the fact that donors are few, a heart transplant continues to be the best option for patients of end-stage heart failure, says Kaul.